One of those clickbait looking '5 weirdest unexplained monsters' videos but I quite enjoyed this one .. the voice over's a bit irritating though .. (I've no idea why there's a picture of someone in a werewolf suit on some stairs though) ..
My take of the above video, with a bit of tong in cheek. The last one is a mangy moon bear cub. The Tsunamy 'creature' seems to be foamy water. As for the first one, it could be a large conger eel. The Ningen on the photo... Looks like a difformed white bear caught on google Earth, if it is possible on the north pole. And a manta ray type of fish in a dodgy light, on the video. As for the creature of Portugal, could be a lost brit tourist after as few! (Just kidding) or more likely someone in a suit and on stilts. It doesn't seem to move its hands. They are just hanging on its side. The Ningen on the photo... Looks like a difformed white bear caught on google Earth, if it is possible on the north pole. It's a polar bear. I think there's been a glitch in the automatic photo splicing software, and it's missed out the bear's front legs - joining the head onto the bear's hindquarters. That...or as you say, malformed. IMHO the legs are too long and spindly to be a polar bear. My gut reaction to this photo (however many years ago it first appeared ... ) was that it was a human struggling to get into or out of an all-white suit (e.g., drysuit / wetsuit). One obvious question would be why would anyone wear an all-white suit (rather than something brightly colored, for safety / visibility) around polar waters. One straightforward possibility would be camouflage for hunters (e.g., Inuits) or military personnel in winter gear. In any case ... 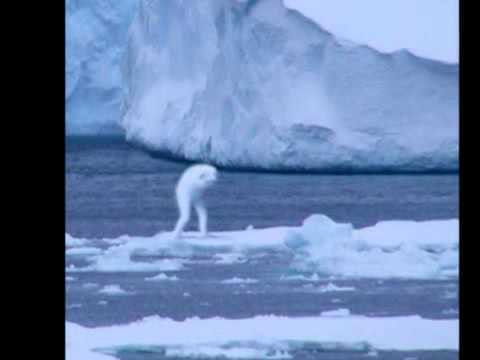 The classic Ningen has forelimbs, unlike the figure in this photo. I've never understood why people familiar with the Ningen stories would ever mistake this bizarro figure for a Ningen. The History Channel's Most Dangerous Cults In the World .. I'm a big dark 5 fan. It is text based, so no narrators, but great music and it covers some cracking topics. This isn't too bad .. added bonus in that the commentator hasn't got an annoying voice .. Very interesting, and a very nice voice as well. Swedish Bigfoot? I think they be trølling. 1. Giant eel... or an anaconda. That begs the question of what an anaconda is doing in Iceland. Escaped a freighter? 2. The footage is of a stingray. 3. Haku from Spirited Away. 4. Guy in a suit walking on tiptoes. 5. Mangy moon bear confirmed. I've been enjoying these guys. Entertaining story tellers who could be my neighbors. Actually Coonbo is from a community not far from me. The problem with that theory is that the splicing is smooth both on the animal and the enviroment around. There should be a vertical splice in the photo where the cut is supposed to be. Nothing seems to have been removed or covered by a splice in the photo. If anything it's possible the "creature" was created separately and pasted into the photo. Didn't Mordrake "live" in 1895? At the risk of being jumped on all over, the surname Mordake reminds me of Mandrake, the plant that resembled humans at the roots .. The one about the soldiers in Afghanistan has got the creepy award. Perhaps because the witnesses are alive and if any investigation of the village was done...seemed like the horrific creature tore them apart. No guess as to what it was. Makes me glad in a way that there's lots of distance from that place. Good one Swifty...and I have to sleep soon. I appreciate (and respect why) reputable Forteans might turn their noses up at these 'top 5 creepiest' type Youtube videos (because they're sensationalist and never give enough information) .. but I enjoy them for whaat they are and for those times when I haven't got the attention span for a full documentary .. sort of like those books you read as a kid in the 70's ..
Not sure where to post this one .. I can't listen to that guy anymore he pronounces ouija like ooo-eee-jaa it's so annoying! Not as annoying as that American bloke who does similar vids to these, his voice is all over the place and every sentence ends in a stretched out down key .. Here he is .. his voice does my head in ..